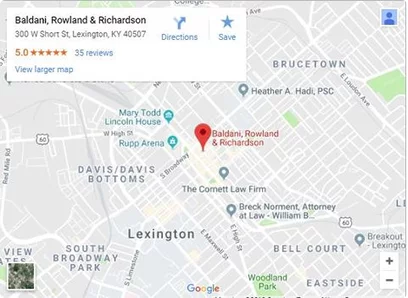 With over 100 years of combined legal experience in Kentucky, our team of attorneys at Baldani Law Group have tried some of the highest profile cases across the Commonwealth. We use that extensive and local experience to aggressively fight for the most favorable outcome for our clients. Every case deserves the best possible representation. We understand criminal prosecutions, family issues, and serious accidents can have devastating effects on you and your family. Whether our clients are seeking justice, mercy, or what is rightfully theirs, it is our honor and privilege to represent them to the best of our ability and make sure they are treated in accordance with the standards and principles of justice. If you or a loved one has a criminal, family, or personal injury case in Versalles, Kentucky contact us today. Our team of lawyers is here to help every step of the way. Friday: 8 a.m. – 5:30 p.m.